Is your “blog” the only official notification that we will get of this, or should we just believe what we read in the Albany Times Union. That lack of officially produced and distributed information is profound! I seems that there is now a disincentive to stay, unless you are very close to 30 years (like I am)…..
Our blog is just one way we reach out to our members to keep them informed about their membership. The NYSLRS website is another important place to learn about the benefits available to you. You can read up on your retirement plan in your plan publication, sign up for our monthly e-newsletter, find forms you may need and more. Our Facebook page and Twitter feed also provide a lot of up-to-date NYSLRS news you might find helpful. We also send customized statements to our members and retirees every year. If you are a Tier 1 – 4 member, you only need 5 full-time years of service to be eligible to receive a pension benefit, however, the NYSLRS Social Media Team cannot access your account information. What age you can retire with a “full” pension benefit (no early age penalty), and how much your pension might be, depends on your retirement plan, your Tier, and your earnings when you were working. In order to get the account-specific information you need, please email our customer service representatives using our secure email form (see link below). One of them will review your account and address your questions. Filling out the secure form allows us to safely contact you about your personal account information. Please allow five to seven business days for a response. So if you have over 30 years, you get punished to 1.5% of your FAS. That is not right! Laws governing the New York State and Local Retirement System are established by the New York State Legislature. Our pension system is designed to help state and local governments recruit and retain quality employees and to provide a secure retirement to these employees when they reach a certain age. According to the law, if you have 30 or more years of service you can retire without a reduction starting at age 55. As a Tier 3 or 4 member, your benefit will equal 2 percent of your final average salary (FAS) for the first 30 years, and then 1.5 percent of your FAS for each year beyond 30. Several colleagues in my office are adamant that an employee requires an additional six months of age and service time in order to retire without any reductions, in other words, 30 years, six months of service and 55 years, six months of age. Can this rumor be debunked? 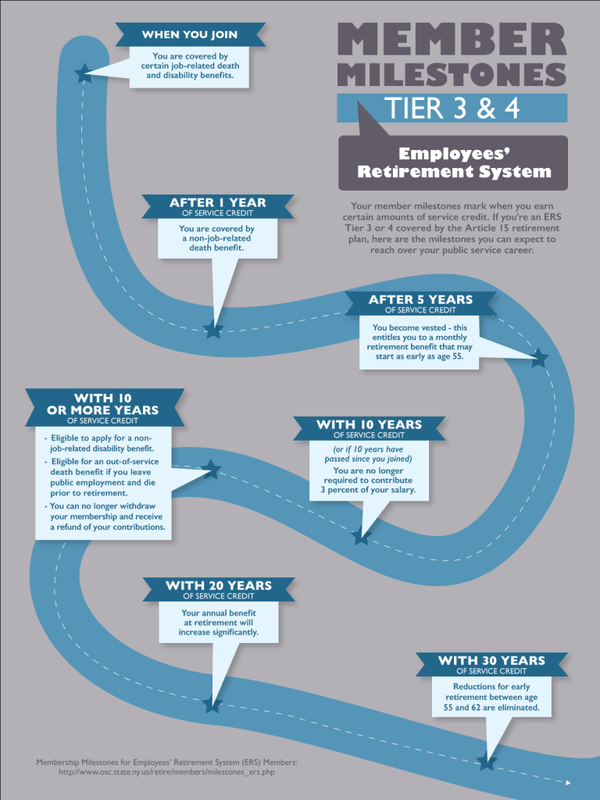 Most Tier 2, 3 and 4 Employees Retirement System members can retire as early as age 55 with no benefit reduction if they have at least 30 years of service. They do not need 30 years and 6 months of service. For more information, please review your plan booklet, available on our Publications page. OK so choose to work beyond my 30 years, should I retire now or still work? What benefits me? Only you can decide when the right time is for you to retire. If you’re an ERS Tier 3 or 4 member with more than 30 years of service, you would get 2% of your final average salary (FAS) for the first 30 years, and 1.5% of your FAS for each year after that. So, if you retire with 30 years, you would get 60% of your FAS. If you retire, for example, with 35 years of service, you would get 67.5% of your FAS, and likely your FAS would be higher as well, assuming you’ll have payroll increases along the way. Your Member Annual Statement, which you should receive in the spring, should give you a few different benefit projections based on your retirement plan and your current salary. You can also use our online benefit projector calculator. Try entering different possible service credit totals and FAS amounts to see how your benefit might change if you work beyond 30 years. The last bullet in your list of criteria suggests that one will get 1.5% of FAS per yr of service beyond 30 years without an upper limit. However everyone I know thinks that additional credit will stop once 37 yrs of service are reached, I.e. Working beyond 37 yrs will not increase benefits. Can you clarify? For Tier 3 and 4 members retiring under the regular plan, you would indeed get 1.5 percent of your FAS for each year beyond 30, and there is no upper limit. Those people may be in Tiers 1 or 2. Or they have heard enough people in those tiers talking about retirement, and assume the same rules apply to them. In tiers 1 & 2 they continued getting 2% a year of their FAS past age 30, but they had a hard cap at 75% of their FAS. They hit this cap at 37.5 years of service. Working past that point did not increase the percentage of your FAS that your pension would be, though the salary portion of that could be increased through raises/promotions. In tiers 3 and 4 our pension increase drops to 1.5% of FAS for each year past 30 years, but we don’t have a cap. That means we have to work 40 years to hit 75% FAS (60% for the first 30 years and 15% for the next 10). But if you work more than 40 years it can go higher than 75%. Is there a benefit of working 15 days past the date you turn 62? Seems that I saw that somewhere. In most cases, the benefit to working 15 more days would not be significant, but it can depend on your retirement plan, how much service credit you have and other factors. To get the account-specific information you need, please email our customer service representatives using our secure email form (http://www.emailNYSLRS.com). One of our representatives will review your account to address your question. Filling out the secure form allows us to safely contact you about your personal account information. Please allow five to seven business days for a response. You can also find information about your retirement plan on our Publications page at http://www.osc.state.ny.us/retire/publications/index.php. My wife just found out after 17 years as a Tier IV employee that she had signed up for the ORP when she was hired. She was given no time when she filled out her paperwork and the gentleman who was helping her instructed her that ORP was a better option than state pension. Is there any recourse and option to get back into the state retirement pension? My feelings are that the HR person was pushing hard to get her to take ORP and that the motive behind this was because the state wanted this ad was not looking out for the employee. She will now have to work until she is 59.5 to draw on her 403 and would have been able to retire at 55 with 33 years in the state retirement system. Any help or suggestions would e greatly appreciated. We’re sorry, but the NYSLRS social media team can’t offer advice about your wife’s situation. If you are referring to the optional retirement program TIAA, then who she should contact depends on her job title. If your wife is a teacher, she may need to contact the New York State Teacher’s Retirement System. If she has questions about membership with the New York State and Local Retirement System, your wife can email our customer service representatives using our secure email form, One of our representatives will respond to her questions. Filling out the secure form allows us to safely contact you about your personal account information.